Director Michaël Roskam made a strong debut with Bullhead, an ominous Belgian drama that was nominated last year for an Academy Award for Best Foreign Picture. A yarn about petty criminals and black market steroids, the film featured an excellent lead performance by Flemish actor Matthias Schoenaerts as Jacky, a farmer and small time criminal who, jacked up on hubris and hormones, was slowly seeding his own destruction. With his new noir thriller,The Drop, Roskam chose a Dennis Lehane short story, “Animal Rescue,” and transplanted it from Boston to Brooklyn. A wise decision: from The Boondock Saints through Mystic River,The Departed, and Ray Donovan, the mash-up of Southie crime and the Catholic Church has become more than a little tread-worn. Lehane’s story is well suited to New York’s grimy streets and working class neighborhoods, where the Catholic Church still looms large. Roskam’s visual style emphasizes the proletariat faces and dark spaces of a dingy terrain filled with the omnipresent one–upsmanship of small time crooks. 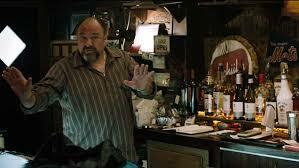 James Gandolfini, in his final role, is Cousin Marv, manager of a small bar now owned by tougher hoods than he. “I used to own this place. That was my name above the door. I was respected. I was feared,” he confesses sadly. Marv’s a dialed-down Tony Soprano with thug ambitions. 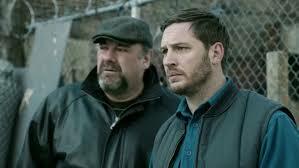 Tom Hardy is his cousin, Bob Saginowski, who tends the bar and tries to keep the hot-headed Marv out of trouble. Bob warns his cousin not to hook up with the brutal Chechen mobsters who now control the bar and launder money through “drops” at the establishment. “You’ll be a dead man” Bob warns. “We’re already dead. We’re just walking around is all,” Marv responds. Meanwhile, a weary cop (John Ortiz) is investigating various illegal neighborhood activities. Add to this volatile mix a subplot that involves a puppy Bob rescues from the trash one night. This act of kindness introduces him to Nadia (Noomi Rapace), a waitress with a sociopathic ex-boyfriend and the previous owner of the abused canine. He’s played by Matthias Schoenaerts with the same unpredictable menace he brought to Bullhead. The film’s characterizations never go beyond well-worn noir archetypes, but its sharp dialogue and the unpredictable convolutions of the plot keep the viewer on edge. 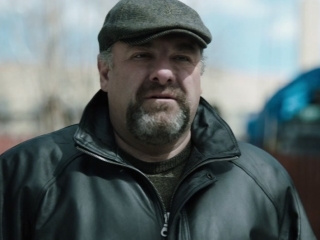 Gandolfini does his final appearance full justice; it is great to see him exit with such a meaty role. But The Drop really belongs to Hardy. After chewing the scenery and spitting it out in chunks as Bronson in Bronson, he took on high profile turns in Warrior and The Dark Knight. Then, in Locke, he made a leap forward, playing a construction foreman under great personal and professional pressure. The solo performance took place entirely at night in the Locke’s car; the character deals, via cell phone, with a continuous array of crises. Regardless of what one thinks of the self-conscious concept, Hardy was riveting. Now, as Bob, he tackles a character whose wounded Brooklyn accent gives Marlon Brando’s Terry Malloy from On the Waterfronta run for his money. Both Terry and Bob are essentially good-hearted guys in a world of gangsters they want no part of — both meet a girl they would give it all up for. Cue the rescued puppy. (Terry raised pigeons). Hardy is British, but he masters mumbling Brooklynese and comes up with a brilliant portrait of a calm man at the center of chaos. In fact, Hardy and the international cast members give more interesting performances than the film’s parade of American regulars. Notice the final close-up of Hardy’s face. I don’t think he moves a muscle, but somehow the actor conveys everything that matters.